Some of Jack the Ripper's victims appear to have been living respectable domestic lives just a few years before their murders, according to census records that went online today. 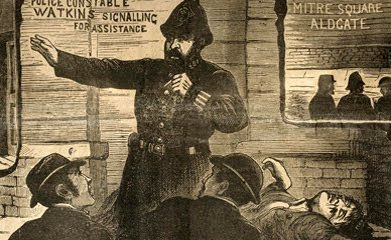 The company findmypast.com trawled records of Britain's 1881 census for information on the five women generally accepted as victims of the Ripper: Mary Ann Nichols, Annie Chapman, Elizabeth Stride, Catherine Eddowes, and Mary Jane Kelly. All were killed between August 31 and December 20, 1888, in London's East End, where they worked as prostitutes. Their bodies were horribly mutilated. The records reveal that several of the victims were living with husbands and children in 1881, apparently resorting to prostitution only later, following the disintegration of their marriages. According to newspaper reports of the time, none of the victims was living with their husbands at the time of their deaths. 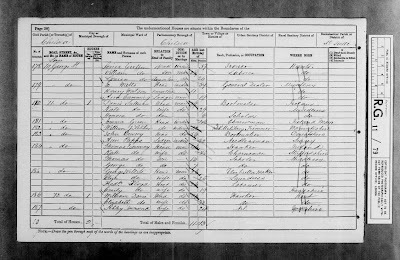 Catherine Eddowes, who was 38 in 1881, appears in the census as "Kate Conway" (below) and is listed as a "charwoman" living with her husband John Conway, an Irishman listed as a "hawker," and their two children. Annie Chapman, then 40, was living with her parents but listed as a 'stud groom’s wife.' Her husband, John Chapman, was living above stables in St Leonard’s Hill, Berkshire; later in the year his wife joined him there. But in 1882 the couple’s 12-year-old daughter Emily died of meningitis and both parents began drinking heavily. The marriage ended in 1884. It seems that Annie Chapman was then forced onto the streets to support herself. Elizabeth Stride, 37, was living with her husband John, a carpenter, in 1881. Unlike the others, Stride, who was from Sweden, had already been registered with the police as a prostitute, at the age of 22 in Gothenburg. The other two 'canonical' victims of the Ripper, Mary Ann Nichols and Mary Jane Kelly, do not appear on the census, suggesting that they were already out walking the streets on the night the census was taken, April 3, 1881. However, Nichols, who was 43 at the time of her murder, was married with three children at the time of the 1871 census. "Some people treat the Jack the Ripper story as a bit of a game," says Alex Werner, a Museum of London historian who curated a recent Jack the Ripper exhibition at the Museum in Docklands. "It wasn't a game. It was a crime against real people in the East End, people who had fallen on really hard times, who had gravitated to the East End as a place where they could earn some kind of living as a prostitute." Thank you so much for posting this - I thin that the census is a very important tool in historical esearch (not just straight genealogy) and this is a perfect example of that. Interesting. I very much enjoy your blog. Thanks for what you do! This is very interesting information. Many thanks for putting together this site. I love it. This is so interesting... of course it is easy to forget that these victims are real people... but presumably some of them have descendants alive today. I have always found the census invaluable for putting meat on the bones of genealogical research... thank you for the post.